Looking for a truly one-of-a-kind gift for the folks on your list this holiday season? At Conway Glass, you can create your own unique blown-glass Christmas ornament – and enjoy a fun and interesting learning experience while making it. Located on 12th Avenue in the historic Mayfair neighborhood of Conway – about 19 miles inland from Bay View Resort – Conway Glass is a full-service glass company that has served the Grand Strand since its founding over 30 years ago in 1986. 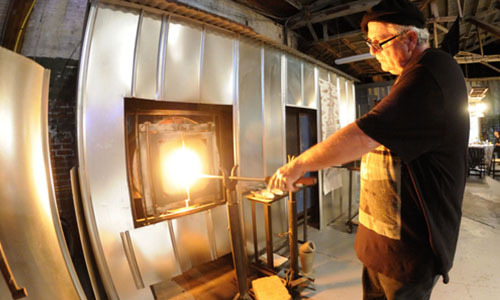 The company’s 100-year-old, recently restored brick building houses a gallery featuring mixed-media sculptures, vases, bowls, ornaments and other works of glass, as well as four professional craft studios, including a stained-glass studio, a dye studio, a fiber studio and – most pertinent to this article – a glass-blowing studio.